When the Whales were introduced as the 1992 SCS Annual Edition, SCS membership was steadily increasing in numbers. More Swarovski fanatics were becoming members in this exciting Swarovski Club. The authentic Swarovski Whales Certificate was the second certificate to be like a stapled pamphlet, with each page featuring a different language: English, Spanish, French, Italian, German, Dutch, Flemish, and Chinese. The certificate has a mostly-white cover and measures 5.5” high and 3.5” wide. The first page of the Whales Certificate features a picture of the Annual Edition, which can be matched up with the picture on the Swarovski Whales Box. The reference number for the Whales certificate, assigned by Swarovski, is located on the reverse side of the certificate in a tiny font. Officially, the Swarovski Whales certificate is DO4MM92XX. The Whales ‘Care For Me’ Certificate can also be found using another reference #DO1X921C, which was originally used in the Warner’s Blue Ribbon Books on Swarovski insurance price guide. With respect to availability and replacement value, the SCS Swarovski Whales Certificate is not presently available at reputable broker site or auction sites in the USA. At Crystal Exchange America, the last ones sold were in the range of $50 – $100. Crystal Exchange America recommends buying Swarovski SCS AE figurines as a complete package with original box and original certificate. Swarovski Eeyore – 9100 000 390 / 1 142 842. Eeyore was designed by Dominic Schöpf and retails for $290. Swarovski Piglet – 9100 000 387 / 1 142 841. Piglet was designed by Elisabeth Adamer and retails for $120. Swarovski Tigger – 9100 000 389 / 1 142 841. Tigger was designed by Anton Hirzinger and retails for $300. Swarovski Winnie the Pooh – 9100 000 385 / 1 142 889. Winnie the Pooh was designed by Anton Hirzinger and retails for $230. The 2012 Swarovski Disney figurines are quite lively with their new coloring and will certainly allow for Disney fanatics to get in on the Swarovski Crystal-collecting action! 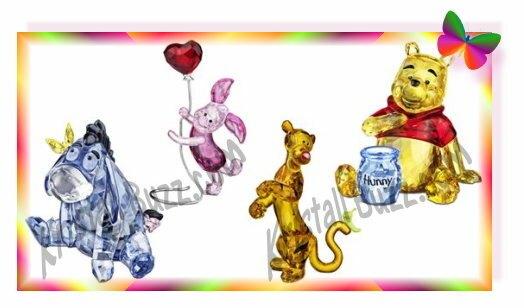 Swarovski Winnie the Pooh – 9100 000 079 / 905 768. Swarovski Pooh retired in 2012. Swarovski Piglet – 9100 000 082 / 905 771. Swarovski Piglet retired in 2010. Swarovski Tigger – 9100 000 080 / 905 769. Swarovski Tigger retired in 2010. Swarovski Eeyore – 9100 000 081 / 905 770. Swarovski Eeyore retired in 2010. Swarovski also produced a title plaque for the clear Swarovski Disney Pooh friends: Winnie the Pooh Title Plaque – 9100 000 083 / 905 772. The plaque was also designed by Mario Dilitz and retired in 2010. If you like the new colored figurines, place your order with Swarovski.com or any authorized retailer. If you prefer the clear Swarovski Disney figurines, those would have to be purchased from a secondary market dealer like Crystal Exchange America. The Swarovski Whales is the third crystal figurine of the second Swarovski trilogy is the “Mother and Child”. All SCS crystal figurines in this series were designed by Michael Stamey, and to date, is the only trilogy by a single designer. In 1992, the Swarovski Whales could be purchased by SCS crystal collectors who possessed membership in the Swarovski Club (SCS). The Swarovski Whales measures about just over 4” in height. This crystal figurine features a clear mother whale and a clear baby whale, with a gentle wave under them. The ‘Care For Me’ Whales can be identified using the Swarovski part number DO1X921 or system number 164 614. 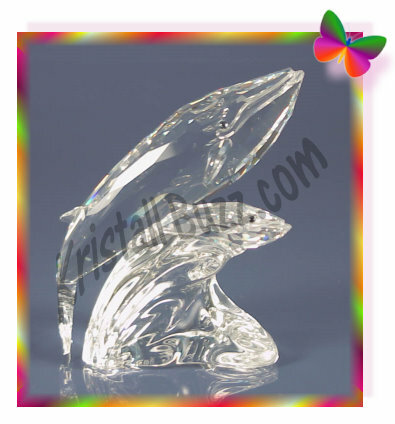 Swarovski Whale – 7628 080 000 / 014 483. This Swarovski Whale was available 1987 through 1991. It can be found with either the Block SC Logo or the Swan logo. Swarovski Walter the Whale – 9460 200 023 / 680 508. This small blue whale was in the Swarovski Crystal Moments line, and was available in 2005 and 2006 only. Swarovski Young Whale, SCS – 9100 000 338 / 1 096 741. This is the companion whale to the 2012 Swarovski Annual Edition Whale designed by Stefanie Nederegger. ‘Care For Me’ Whales is a SINGLE figurine. Paikea Whale and Young Whale are 2 separate figurines purchased individually. ‘Care For Me’ Whales are completely clear figurines. Paikea Whale and Young Whale are Shadow crystal with Crystal Moonlight accents. The SCS Swarovski Whales retailed for $265 USD in 1992. The purchase price included the SCS crystal figurine, a white cylinder with fitted- foam specific to the Whales, and a Swarovski Certificate of Authenticity (Swarovski COA). Presently, the Swarovski Whales, in mint condition, complete with original packaging can generally be purchased on the secondary market for $305 – $345 from professional Swarovski expert dealers, like Crystal Exchange America. The second crystal figurine in the Swarovski SCS “Mother and Child” trilogy was the Swarovski ‘Save Me’ Seals. The Seals were a charming figurine illustrating a new mom and her young seal pup resting on an iceberg. The Swarovski Seals Box is designed to protect and store the crystal figurine. The SCS Seals Box is a big white cylinder with silver-gray end caps. It is much like the Turtledoves Box and Dolphins Box at a quick glance. On the Seals cylinder, collectors can read the text ‘Annual Edition 1991 “Save Me” – the Seals. This same text is repeated in 5 other languages on the cylinder container. The Swarovski Seals Box can be found using reference # DO1X911B, which was originally used in the Warner’s Blue Ribbon Books on Swarovski Price Guide. There is no number on the Seals Box to indicate a factory-assigned identification number. 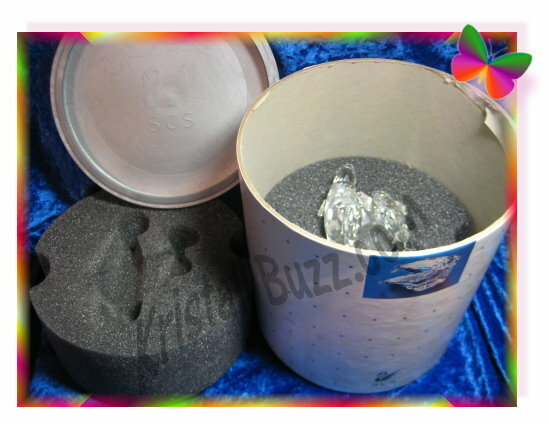 The custom foam in the cylinder is specific for the Swarovski SCS Seals figurine. This packaging for the Seals is the first to use two completely separate pieces of foam vs a single foam utilizing a (foam) hinge. 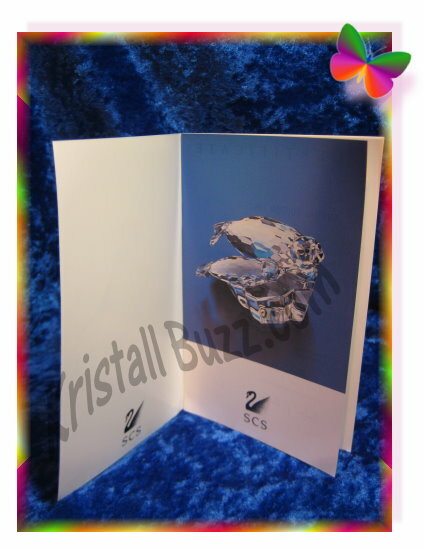 The Swarovski Seals Certificate is simply placed on the top foam before putting the gray cap on it as it is small enough that bending does not occur. Proper placement of the Save Me Seals in the box is fairly simple. The Seals tail should be placed over the ‘round’ holes / bubbles in the foam and the figurine will easily fit into the foam. The top foam has similar bubbles / holes that also go over top the tails. Then aligning the notches along the foam sided allow for the Swarovski-designed fit. (Hint… When I put the top foam in, I gently twist / untwist the top foam, with a slight downward pressure, to ensure that the foam is pressed down as much as it is supposed to be.) When in proper position, there is about a ½” of the cylinder showing above the foam for the lid to fit on. The SCS Seals Box can be found at Crystal Exchange America in the Empty Boxes category. A number of them are available in the $90 – $110 price range at this time. All the Save Me Seals boxes include original foam inserts. SCS membership was continuing to grow across more countries when the Seals were introduced as the 1991 SCS Annual Edition. Whereas the Swarovski Dolphins Certificate included 7 different language translations, the Swarovski Seals was the earliest certificate to include yet one more language. 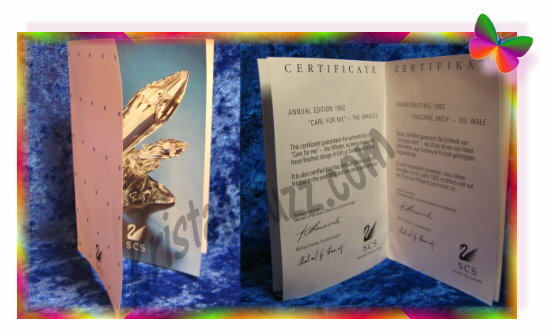 The genuine Swarovski Seals Certificate was the first certificate to be like a stapled pamphlet, with each page featuring a different languages English, Spanish, French, Italian, German, Dutch, Flemish, and Chinese. The Swarovski –assigned reference number is located on the back side of the certificate in tiny print. Officially, the Swarovski Seals certificate is DO4MM91XX. The Seals ‘Save Me’ Certificate can also be found using another reference # DO1X911C, which was originally used in the Warner’s Blue Ribbon Books on Swarovski insurance price guide. Regarding availability and replacement value, the SCS Swarovski Seals Certificate easy to find at the moment. At Crystal Exchange America, the last ones sold were in the neighborhood of $50 – $150, there are not a high number of transactions on them for a consistently reliable replacement value. We recommend purchasing Swarovski SCS AE figurines as a total package with original box and original certificate. The Swarovski Seals is the second crystal figurine of the second Swarovski trilogy is the “Mother and Child”. All SCS crystal figurines in this series were constructed of completely clear crystal components, which is a unique characteristic of all the Swarovski SCS figurines. The Swarovski Seals could be purchased only in 1991 by SCS collectors with membership in the Swarovski Club (SCS). The Swarovski Seals measures about 4” long. It is a figurine with 2 clear seals, a mother seal and a baby seal, resting upon a clear iceberg. The ‘Save Me’ Seals can be identified using the Swarovski part number DO1X911 or system number 158 872. 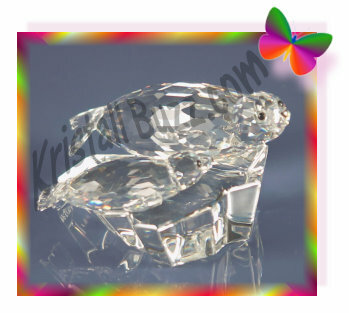 Swarovski Large Seal – 7646 085 000 / 012 261. The Swarovski Large Seal was produced with 3 different styles of noses / whiskers. The Large Seal, in some variation, was available 1985 – 1995. Swarovski Baby Seal – 7663 046 000 / 012 530. The Swarovski Baby Seal was produced with 3 different styles of noses / whiskers. The Baby Seal, in some variation, was available 1986 – 2005. The SCS Swarovski Seals retailed for $225 USD in 1991. The purchase price included the SCS crystal figurine, a cylinder with custom foam for the figurine, and a Swarovski COA (certificate of authenticity). At this time, Swarovski Seals , in mint condition, complete with original packaging can generally be purchased on the secondary market for $350 – $400 from professional Swarovski expert dealers, like Crystal Exchange America. Swarovski Limited Edition Christmas Tinker Bell 2012, Dressed Like Mrs Claus! While I have not seen or heard any news from Swarovski, I have been seeing a Tinker Bell in Red on various authorized retailer web sites and on Ebay too. Here are my conclusions about the Swarovski 2012 Tinker Bell…. 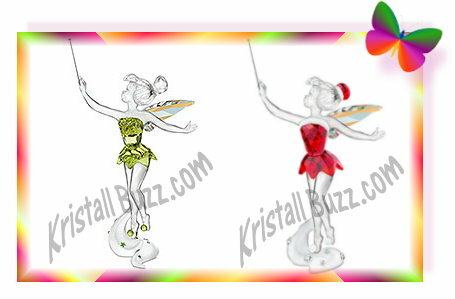 Swarovski Red Tinkerbell is a Limited Edition in 2012. It is not clear if there is a maximum quantity of production or if distribution is limited in some way to geographic area. Swarovski Limited Edition Tinkerbell will retail for $315. Swarovski Christmas Tinkerbell is about 5” tall. Swarovski Green Tinker Bell has a more curvy base than Swarovski Red Tinker Bell. Swarovski Green Tinker Bell has green poms on her shoes. Swarovski Red Tinker Bell has white poms on her shoes. Swarovski Green Tinker Bell has a clear bun on her head. Swarovski Red Tinker Bell has a red bun on her head. Both Swarovski Tinkerbell crystal figurines appear to have a silver toned wand and have Aurore Boreale wings that shimmer. This video, posted by an authorized retailer in the USA, shows The 2012 Swarovski Christmas Tinker Bell rotating in 360 degrees for a total view of this limited edition figurine. In 2008, the crystal giant also produced another Limited Edition Swarovski Tinker Bell which has commands an unusually high price of $700-$900 following retirement. The newest Swarovski Limited Edition Tinker Bell (Christmas Tinker Bell) looks like a real beauty the Disney fanatics and Swarovski crystal fanatics will certainly want to purchase! Swarovski Cupcake for the Kingdom of Jewels Extravaganza! Swarovski is presently running a Kingdom of Jewels contest in September for a chance to win the global prize: a weekend trip for two to Paris, a private styling session with Swarovski’s Creative Director, Nathalie Colin and tickets to an unforgettable Brisa Roché concert. As a part of this month-long journey, Swarovski has planned some “inspirational experiences” in 15 cities from around the world, one of which is New York City. Many of these experiences / events require a special “Swarovski Jewel” for admission, which could be picked up from select Swarovski boutiques on September 1. From September 6 – 9, Swarovski Jewel Holders can get a sweet treat…. a Swarovski Cupcake from the Magnolia Bakery at Bloomingdales. Swarovski cupcakes may be available for purchase September 10 – September 16, while supplies last. The cupcake cost is about $3.50, of which some of the proceeds go toward charities. The Swarovski Cupcakes look sparkly and yummy. Hopefully all the participants are getting the royal treatment that is Swarovski’s ambition!